DAMASCUS - The flaps of the Bedouin tent were open, and the father, dressed in a long, gray robe and sporting a red and white kaffiyeh, grinned and waved for us to enter. "Where are you from?" he said as his family gathered around him. "The United States," we answered. "Ahlan wa Sahlan, welcome!" the family called out. They ushered us into their desert abode where we leaned on overstuffed pillows and were served tea. In the souks of Aleppo, where locals shop for everything from camel meat to spices, clothing, and kitchenware, vendors and shoppers called out "welcome" and a man pressed hard candies into our hands. And at the Umayyad Palace Restaurant here in the capital, the owner gave me an oval piece of black meteorite with one of Allah's names inscribed on it. "It's for safety and protection during voyages," he said. Were we really in Syria, a country not high on Americans' destinations wish lists? Syria sits at a crossroads in the Middle East. It has been traversed, conquered, and settled over millennia by neolithic farmers and waves of kingdoms and empires including the Hittites, Mari, Canaanites, Amorites, Assyrians, and Phoenicians. It was an important Roman and Byzantine province and, later, was crisscrossed by caravans on the Silk Route from China. There were incursions by the troops of Mohammed, and strongholds built by European Crusaders, occupation by Ottomans, British, and French. Syrians, who gained their independence in 1946, were used to contact with outsiders and remain curious about foreign visitors and their nations. Although the tourism infrastructure is underdeveloped outside of Damascus, the quantity and quality of ancient sites is impressive. My husband and I tracked down a Syrian tour operator on the Web, exchanged e-mails for several months, refined our itinerary, and settled on a 12-day trip that included many historical and cultural highlights. We began in Damascus, headed south, then made a loop through the west, north, and east of the country that included millennia-old towns and fortresses, stark desert, the fertile plains and banks of the Euphrates, Aleppo, and the famed ruins of Apamea and Palmyra. In Damascus, we started out at the National Museum. Writing began in Syria, and the Ugaritic section contains the world's first complete alphabet, going from left to right, incised on a clay tablet. In the Mari rooms, huge white eyes rimmed in black stare at visitors from figures sculpted 4,500 years ago. A separate wing houses an entire synagogue from the third century BC. Elsewhere a gigantic statue of a bearded Assyrian official begs to be photographed, but the museum allows no photos, and there are no books or postcards for purchase. Scholars come with notebooks and sketch the rare pieces. At El Azem Palace, the opulent 18th-century residence of the governor, private and public areas are adorned with spectacular carved and painted wood paneling. Three-dimensional displays of daily customs and religious observances provide a glimpse into Damascene domestic life. 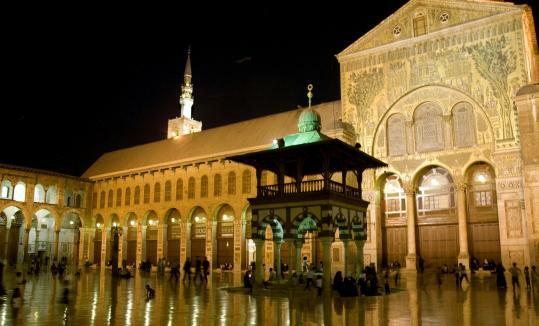 Another must stop is the Umayyad Mosque. Inside are the tomb of Saladin, the military genius who recaptured Jerusalem from the Crusaders in 1187, and, purportedly, the head of John the Baptist. Women visitors to all mosques in Syria are given "yashmaks," long, hooded robes required for modesty. In the city's southeastern suburbs is the Zeynep Mosque, the burial place of Mohammed's granddaughter and a pilgrimage site for Shia Muslims. The devout cry, pray, and some women attach padlocks to the grillwork in front of the tomb. One woman explained that she is "locked" into a problem in her life, and hopes Zeynep will open the lock so she can be free. Shahba, a Druze community about 60 miles south of Damascus, was built between 244 and 249 AD by native son Philip the Arab, when he was a Roman emperor. The Roman theater here is beautifully preserved, and the walls and vaulted doorways of the Roman bath are still standing. In Bosra we were the only visitors at a moat-enclosed citadel built around an ancient Roman theater that held 6,000. You can still see patrons' names carved into stone seats. "It was like season passes," said Ahmed Al Fahel, our guide. As we traversed the stage, nearly half the length of a football field, a group of Syrian teens and their uncle Yusuf surrounded us. "Let's dance," they said. Howling with laughter, we boogied together for an imaginary audience. Then they hugged us goodbye. The mosque in Homs houses the tomb of Khaled, a prominent seventh-century Islamic military leader who never lost a battle. Homs was once a hub of the sun cult; according to Ahmed, to diminish the cult's hold on people, the church adopted Dec. 25, the birthday of the sun, as the birthday of Christ. About 40 miles away the huge limestone walls and semicircular towers of Crac des Chevaliers appear on a distant mountaintop. It's one of the most impressive of the Crusader castles and resembles a small city replete with a windmill, Gothic meeting hall, storage area designed to hold five years of provisions, command tower, loggia with floral motifs carved into stone, oil press, huge circular oven, sleeping rooms, and latrines. Amrit, on the road to Tartus, has the only Persian temple in Syria (from the fifth century BC). Its mysterious ziggurat-shaped altar, dedicated to the god of healing, is surrounded by a pool of water. Half a mile away is a group of "spindles," huge, evocative cylindrical stones ornamented with lions that overlook underground Persian tombs beside them. "I can see you're hot from our blazing Syrian sun," Ahmed said, "but soon you'll feel cooler because we're going to the port of Tartus to take a boat ride." The half-hour ferry ride ended at the small island of Arwad. Arwad once dominated the area, but today it offers little besides littered, winding streets, and trinkets. One area of great interest is where the shipbuilders work; their technology has been passed down since Phoenician times. Saladin's castle, built on a ridge about 15 miles from Arwad and east of the Mediterranean port city of Latakia, boasts a dramatic, 175-yard-long entry chiseled out of rock. The fortress itself is a fine example of early Crusader architecture not substantially modified by later invaders. Also accessible from Latakia, and in an otherwise-desolate desert area, are the ruins of Apamea. The highlight is a seemingly-endless, colonnaded street, still standing from the second century, with the remnants of Roman chariot wheel marks in the paving stones. It was the Fifth Avenue of its day and includes rows of shops protected under porticos. The main attractions in Hama are the huge, wooden waterwheels that date from the Mamluks in the 15th century. Hama is the most conservative city in Syria, and many of the women cover their faces completely. But they still greeted us when we strolled by them in the riverside gardens. Serjilla is one of Syria's "Dead Cities." Settled by the Romans and reaching their height during the Byzantine period, they were prosperous oil and wine exporting towns. Serjilla has several lavish two-story Roman villas that are still inhabited by a few locals. A woman who lives in a tent nearby, accompanied only by her tethered donkey, handed us a sprig of a sweet-smelling green herb when we left. Ahmed smiled when we commented on the open-heartedness of his compatriots. "Our middle name is hospitality," he said. It was somewhat jarring to leave provincial Syria and arrive in Aleppo, a large, noisy, traffic-choked city. We sought refuge in the picturesque Christian quarter, where the narrow, serpentine streets are lined with medieval houses, and toured the impressive Islamic-style citadel. Back in Damascus, Ahmed said he knew we were overloaded with history and sites, but he had one more to show us. We walked down the old Roman Straight Street and at the end came to the Church of St. Ananias. When Saul, who was to become St. Paul, had his dramatic and blinding conversion to Christianity on the road to Damascus, he is said to have been taken in, cared for, baptized, and had his sight restored in this house. Modern-day travelers to Syria have their own conversion when they realize how much the country has to offer. Judith Fein can be reached at Judith@GlobalAdventure.us. Turkish Airlines , now part of the Star Alliance, offers direct flights from Istanbul to Damascus (thy.com). Flights can be booked from other European cities to Damascus on several airlines, although some are not direct. If you have an Israeli stamp in your passport, Syria bars you from entering, as the two nations are officially at war. Count on about $100 a day per person for driver, guide, acceptable three- to four-star hotels with breakfast and entry fees. Request accommodations in restored historic houses when possible. Travelers checks are rarely accepted. Mastercard is refused at most ATMs and banks, and credit cards can be used only in some establishments. It is best to travel with a Visa debit card and secreted US dollars, as most places accept the currency. Excess Syrian pounds cannot easily be changed back to dollars inside Syria.